Peninsula itself is pretty alluring if you’re into village sightseeing, but inevitably trekkers of all kinds (bikers, hikers, and cross-country skiers) get antsy to get back on the path. To that end, there’s plenty to see along this stretch of the valley. Between culverts, Johnnycake Lock, Furnace Run in Everett, Everett Covered Bridge, and the unique Szalay’s Farm—home of the valley’s most popular sweet corn stop during late summer and early fall—this trail has equal parts green-canopied scenery, rural farmlands, and Small Town America with open skies. There’s also the opportunity for advanced hikers to explore the 1.2-mile Deep Lock Quarry loop. Starting and ending in Peninsula constitutes a full day’s thrill for many northeast Ohio natives in peak season. Take I-77 to Miller Road exit. Take a right onto Route 21 to Snowville Road. Take a left onto Snowville Road, and follow it to Riverview Road. Take a right on Riverview Road and follow it until you reach Route 303 in Peninsula. Take a left on Route 303 and drive over the bridge and past the Winking Lizard, then take a left on Locust Street and a left on Mill Street. Follow Mill Street to the Lock 29 parking lot and trailhead. Entrance to the park is free. Tickets are required for the Cuyahoga Valley Scenic Railroad. There’s a lot to explore here and having wheels to take it all in means you can get to everything in less time. With biker-favorite Peninsula as a starting point, this leg tends to draw many cyclists. We recommend padded bike shorts, since part of the trail is limestone and can get bumpy. Peninsula offers ample parking, access to the Cuyahoga Valley Scenic Railroad, family-friendly dining, and shopping. At the southern end, Hunt House is a highlight on this leg of the trip. This restored 19th-century farmhouse is open periodically as an information and children’s activity center and sometimes offers special programming. The restored 19th-century farmhouse, visitor center, and trailhead here make it a must-stop, showcasing the valley’s agricultural past, and hosting special events and programming. If you’re on foot and looking to add some adventure to your return trip, follow the Valley Trail back to Peninsula for breathtaking views and a little more solitude. This is one of the favorite legs of one of Ohio’s premier “scenic bikeways,” and as such, this leg, in particular, is big with the bikers—namely because of the impeccably kept path that accommodates them. 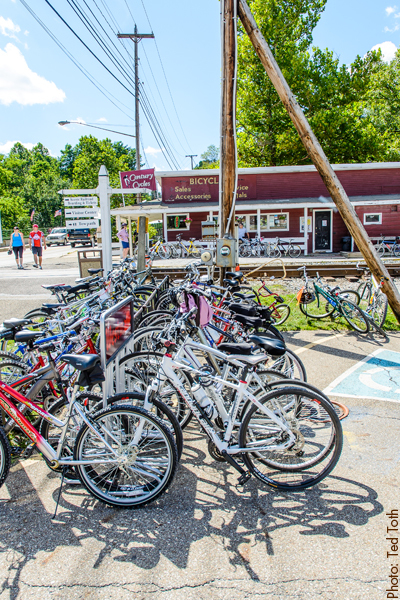 One of the region’s premier cycle shops, Century Cycles, rents bikes in Peninsula—mountains and townies—so if you’re a cyclist but didn’t arrive prepared, you can still enjoy a great ride. A helmet comes with your rental. There are plenty of add-on options available. You can learn more about that here. Cross-country skiers may find some interest in this path as well (the path is especially beautiful in the winter). The trail is also a stone’s throw from a bike trail that leads to Hale Farm & Village, which we cover in the leg of the trail from Hunt House to the Conrad Botzum Farmstead.